Completely Clean 7-Day Permanent Cleanser was designed for those who want to cleanse their blood, urine, hair and saliva. This product will cleanse your system in only 7 days! The detox program includes a healthy, toxin-free diet, daily permanent cleansing capsules and proper water intake. This product is NOT a mask! It safely removes harmful toxins from your body, leaving you clean, healthy, toxin-free, and most importantly, feeling good. This program also comes with one FREE Single Panel Urine Drug Test! PLEASE NOTE: This 7-Day Cleanser is for light users who are under 200lbs only. If you have high toxin levels please see the detox drink page or our Total Body Cleansers. Daily Cleansing: Take 2 capsules with 24 oz of water three times daily for seven days in a row. Urinate frequently to remove pollutants. Morning: Take 2 capsules with 24 oz of water. Eat a balanced breakfast including fruit or 100% fruit juice. Avoid coffee, soda, and sweets such as pastries and sweetened cereal. Exercise for 15-30 minutes to perspire which will help flush out toxins. Mid-Morning Snack: Eat a small fruit or 8 oz 100% fruit juice to stimulate your metabolism. Drink 16 oz. of water to keep your body hydrated and flush toxins out of your system. Lunch: Take 2 capsules with 24 oz of water. Eat a balanced lunch including a green vegetable. Raw green leafy vegetables, like those in a green salad are best. Mid-Afternoon Snack: Eat a small fruit or a small salad with lemon juice for dressing to maintain a quicker metabolism. Drink 16 ounces of water to continue flushing your system. Evening: Take 2 capsules with 24 oz of water. Eat a balanced lunch including a green vegetable. Exercise for 15-30 minutes, making sure your workout causes you to sweat. Evening Snack: Eat a small fruit or 8 oz 100% fruit juice to keep your metabolism working as long as possible. Drink 16 ounces of water to keep your body hydrated through the night. 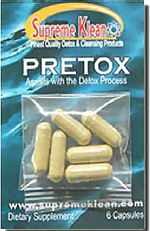 PRETOX Capsules help assist the detoxifying process to clean your system prior to passing a drug test. PRETOX capsules are designed to be used in conjunction with other detox products to aid in detoxification and should not be used alone to pass a drug test. After taking the capsules, individuals should be prepared to urinate frequently. The capsule temporarily speeds up the urinary process during which the releases down drug metabolites.